Well, this is an item I thought I'd never weave! While sorting through the boxes and shelves with yarn that was acquired many years ago, I came across cones of cotton and linen in a variety of quantity and colours. I thought, as I am unable to wear anything woollen, something to wear in the summer would be great. Sampling, dare I admit it, has never been my thing, but I have always been intrigued by peoples enthusiasm for weaving T towels. So I decided to combine the two. 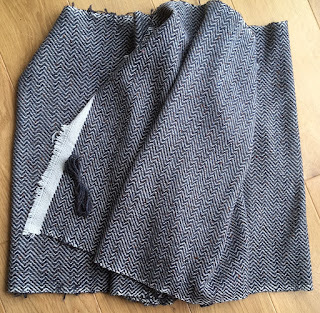 I needed to know how much shrinkage etc if I was to weave a length of cotton fabric for summer wear and why not make samples that could be used!!!! 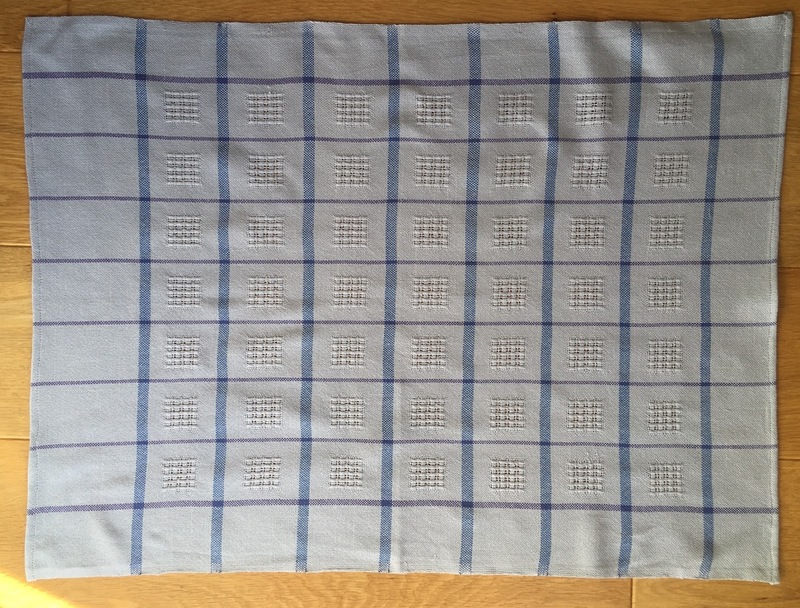 I decided that fabric 20 x 30 inches would make an adequate tea towel and designed a warp 23 inches wide, 5 yards long for 4 towels. A wrap told me that I would need 20 warp threads an inch using the 2/20 thickness. Fortunately, I have that weight of yarn in a few colours. No white or cream so I decided that the silver/dove grey would be my main warp colour. A little boring on its own I decided to have purple vertical stripes. All tabby weave would also be monotonous, so I chose to add sections of 'Swedish lace'. It took some time to design the warp to include 7 lace sections across the width and I planned tabby sections at each side in case my selvedges weren't good enough!!!!! 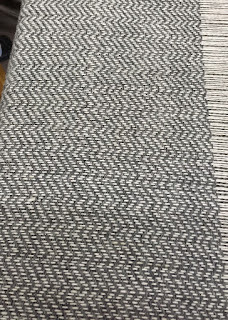 As it happened it was relatively easy to weave straight, neat selvedges and I soon got into a rhythm weaving. Back and front of the Swedish lace pattern. I completed the warp and setting up the loom in one day. 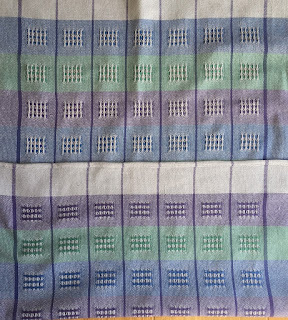 After two days weaving I ended up with 5 tea towels. Each one with a different colourway using purple, blue and green along with the pale grey. I intended to use mainly grey and keep the colours for another project but.... unless I would be prepared to wear a 'multicoloured dream coat' I hadn't enough of the colours. 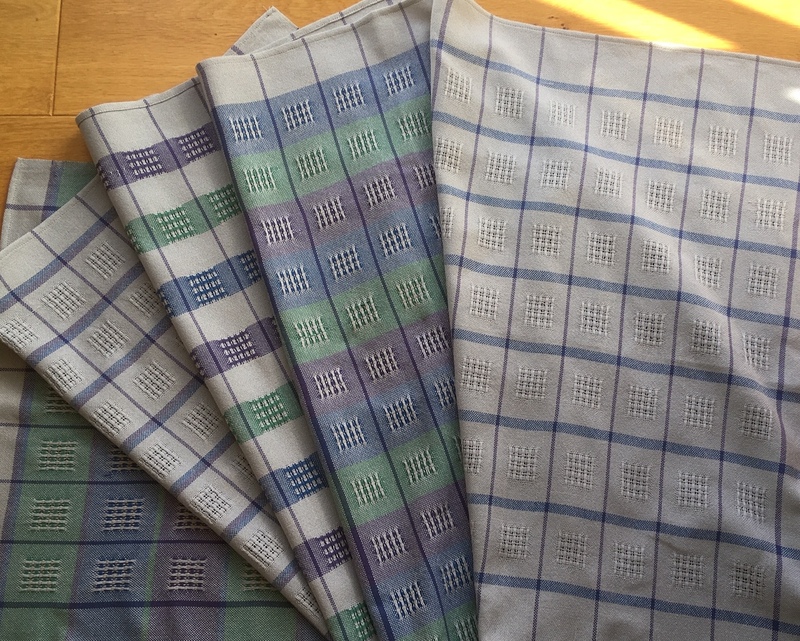 Some of the cottons are particularly shiny so I think they must be mercerised - no good for an absorbent tea towel, but probably great for 'stain free' clothing fabric. A few cones were thinner yarn - 50 wraps to the inch - perhaps they would make a great dress or summer top fabric in a twill based weave. 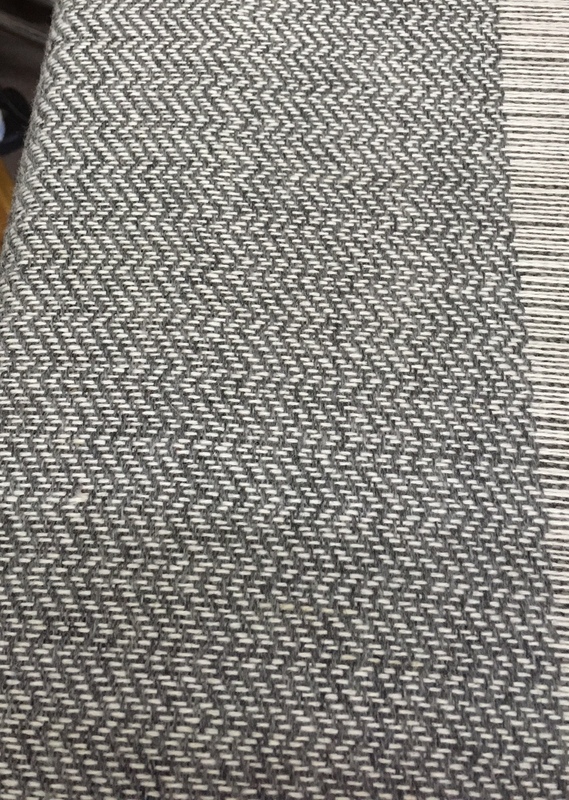 FABRIC WOVEN & OFF THE LOOM ! This is the most nerve racking part of the process. After taking the time to warp your loom, weaving the fabric, cut it from the loom, make any 'repairs', and all has gone well, the next step could ruin it all!!!! Put it down to experience ????? A hard lesson!!!!! Not much comfort there! No matter how many times I wet finish fabric in my washing machine I feel nervous. Especially if I've not used that particular yarn before. Hey ho! In it goes, gently folding it into the drum with plenty of air, no compaction. This piece was washed on the 30 deg. wool programme and I used wool scouring detergent and a little conditioner. I use a length of thick cardboard carpet roll with holes drilled all around it. Attached to this with heavy duty carpet tape is a length of old sheeting which goes round the roll one and a half to two times. The sheeting is approximately 4" wider than the widest width I can weave. It is attached carefully at right angles to the end of the tube. There are no turnings on any edge of the fabric! I believe I may have used some curtain lining fabric for this one. The edges are not cut but torn. The lining fabric has been taped to the roller at right angles to the edge. 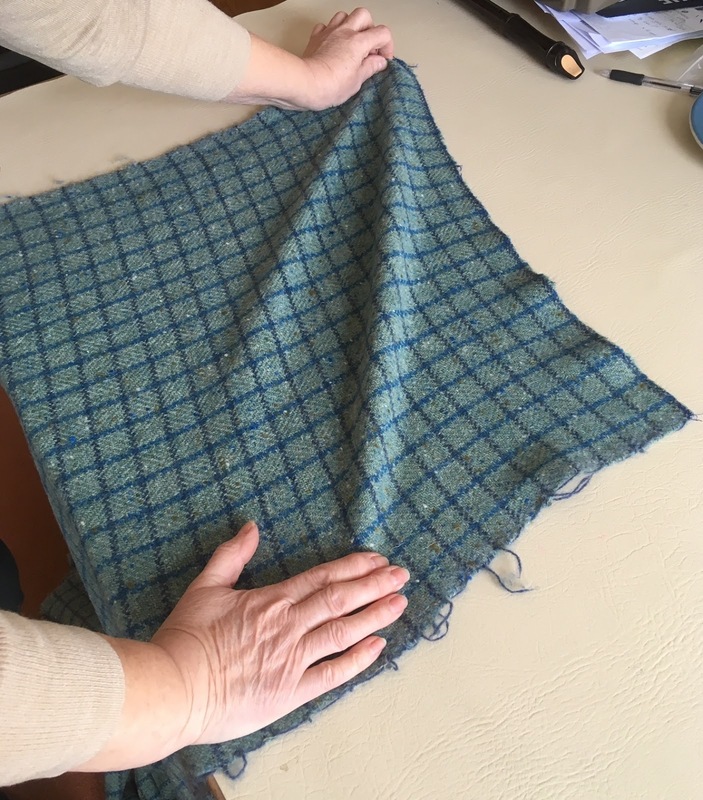 When you take your fabric out of the machine, bowl or bath, depending which method you have chosen the fabric will be crinkled. To take these out and get a flat length to put on the roller work your way down the length in the following manner:- Stretching diagonally, left to right, right to left from one end to the other and again from the opposite end. This will flatten you fabric and square up the horizontal weft leaving it at right angles to the warp. 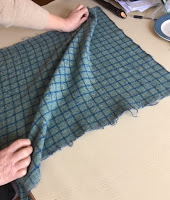 I seem to remember that, at college, a friend and I gathered one end of the fabric length each into both hands and pulled back and forth, between each other, to 'square up' the weave. then we moved on to the drying roller. The next step is to put the damp fabric onto the roller. Put the roller on a flat surface - I usually use my ironing board - with the cotton fabric completely around the roller with the extra length pointing towards you. 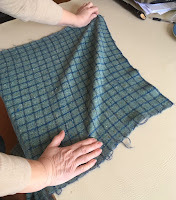 Tuck the end of your fabric up to the roller and parallel with it. With the flat of your hands smooth the fabric width-wise and diagonally keeping the checks square, deep colour stripes vertical and horizontal. When satisfied with the first section roll the roller forward with the fabric wrapped around it. Continue in this way until your fabric is wound onto the roller. 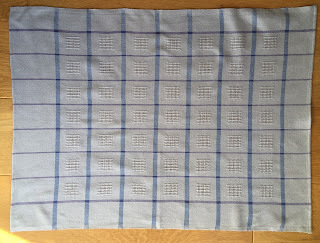 You will find that the width of the wet cloth increases slightly. Once all the fabric is on the roller it is hung up to dry. In my case in the utility room, from 'laundry hooks' on the top of two cupboard doors. After two days I took it down and rolled the fabric again from the opposite end. This speeds up the drying time. Now the big decision........ What shall I make with it? Over the years I have met many 'beginner' weavers who have been disappointed in their first project results and sometimes they have been completely 'put off' the craft of weaving. I'm still working towards encouraging these and new weavers to continue and enjoy this rewarding craft. When you follow a knitting pattern you use the thickness of yarn and size of needles recommended in the pattern instructions. 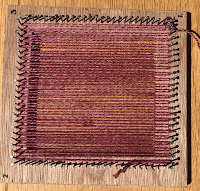 Weaving is similar but you are likely to need to work out, for yourself, the size of rigid heddle in the case of Rigid Heddle weavers, or, in the case of table and floor loom weavers, the reed needed to 'spread' the warp threads on your loom. Weaving yarn is not always sold in the small quantities of knitting yarns - 50 -100g. You may have to buy a cone weighing 500g. Does your intended project need more than this? You need to know before starting, especially if your yarn supplier is not close by! Recently, one of our daughters in law decided she'd like to learn to weave and of course I have encouraged her. I own a portable folding floor loom which I have mainly used for demonstrations at events where I have been selling my wares. So she has no need to buy her own equipment, at least until she is sure she wants to continue. I thought this the perfect opportunity to document the process from beginning to end. 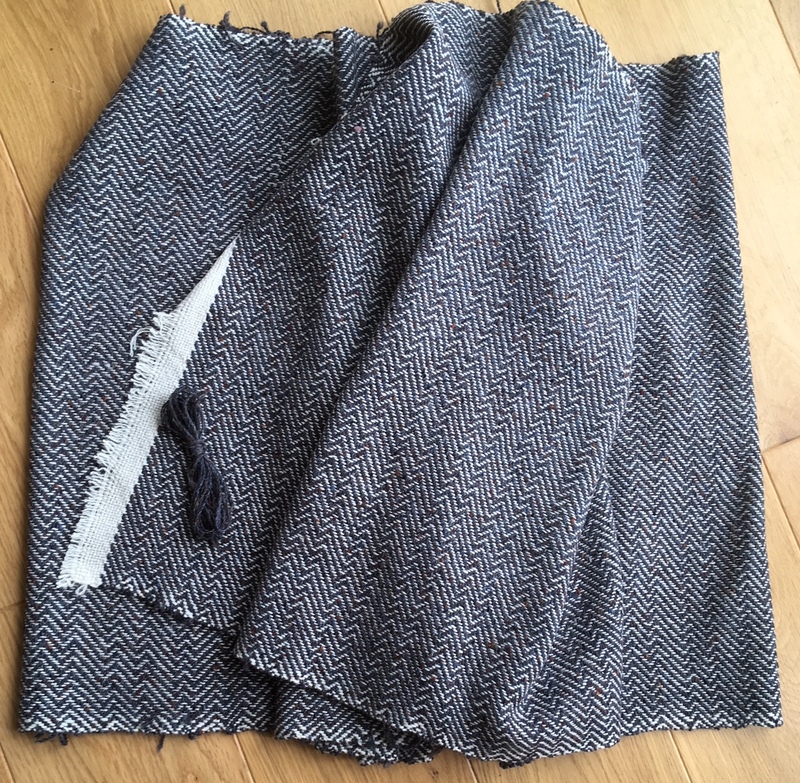 A length of tweed for a shawl is the chosen project. How much yarn do we need to buy? 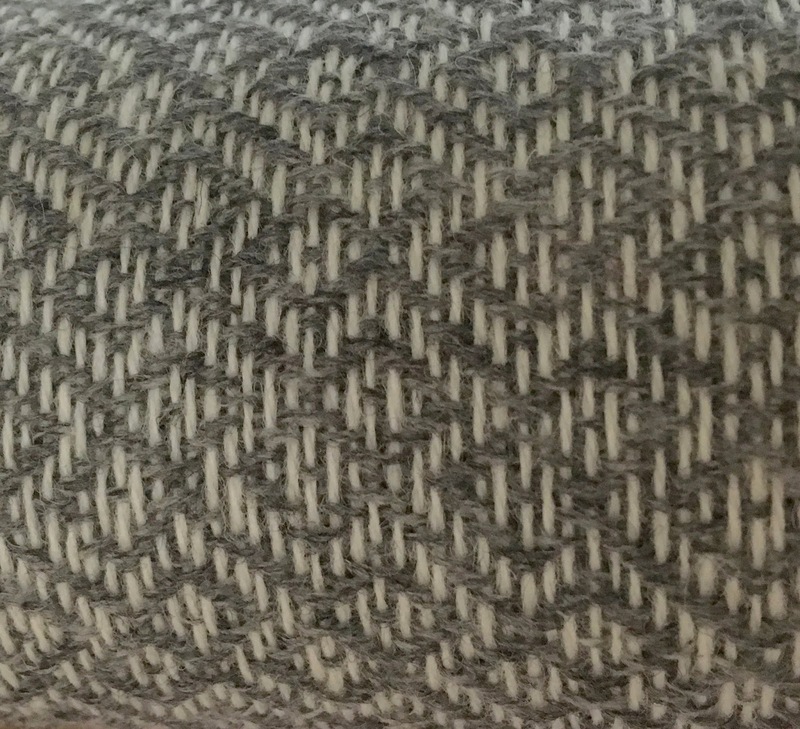 The chosen yarn is a Shetland type from Uppingham yarns. One that I had worked with before and had success. Their colour chart with small sample skeins was ordered and 4 colours chosen, flannel grey and donkey being the main warp and weft colours, with heron and robin's egg chosen to create a square/check design. BUT how much would we need of each colour, especially the main 'ground' colours of flannel and Donkey? Thank fully I had some 'peacock' left on a cone, wraps per inch 24. 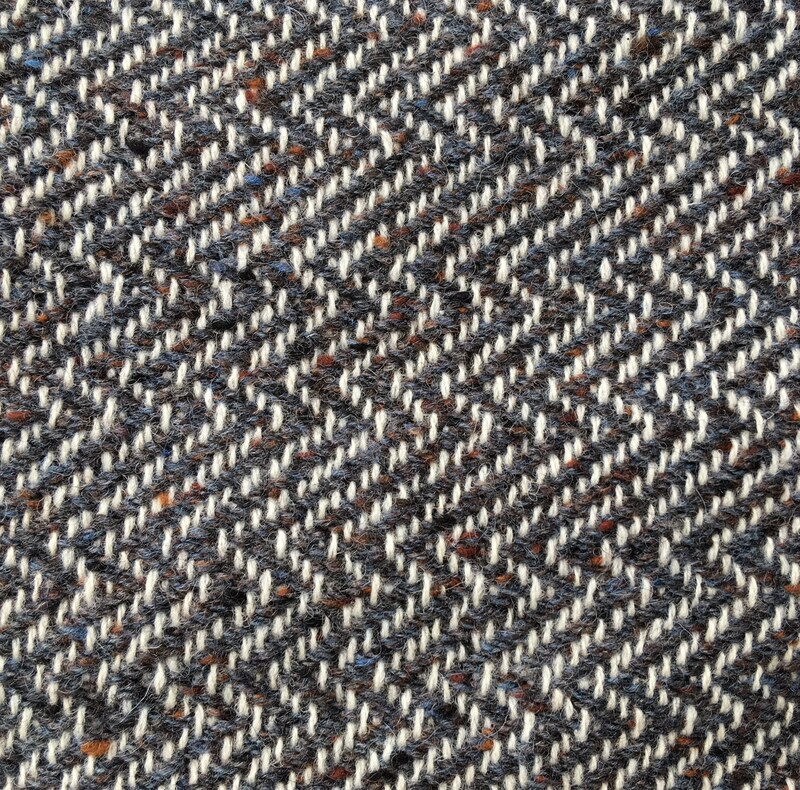 A balanced 2/2 twill weave decided upon meant 16 ends to the inch warp and weft. How long a piece of fabric you we need? 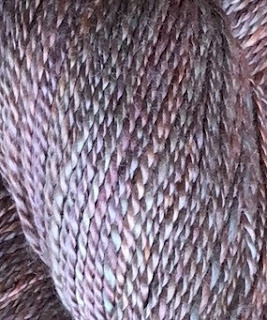 The piece I was to weave, on my Harris 4 shaft floor loom, was going to use the yarns in my last post 'Yarn De-stash 2019'. I required 4 yards of finished cloth, 27" wide. As you weave there will be 10% take up of the fabric width as well as on the length. This is because neither warp nor weft actually take a straight path across or along the length of woven piece, they 'wiggle' up and down as they interact with the yarn at right angles. So, calculate to weave a length of 4 yards + 10%. i.e. 144" + 15" - for easy calculations 160" long. BUT, the length you weave will shrink up to 15% in the wet finishing, so you need to weave fabric 160" plus 15% i.e 24" = 184" length weaving. Hold on!!!! you have to add on your 'loom waste'. That is the length of warp needed to tie onto the front of your loom and the unwoven warp at the end of your weaving when you can't get a shuttle through the 'shed' (space) created when you go to weave another row. In my experience this is 30 to 36 inches in total. So your warp needs to be 184 + 36 = 220" or 6 yards long. N.B. These pictures are not of the project being calculate in this post. HOW MANY WARP THREADS DO YOU NEED? To get finished fabric 24 " wide - add 10% for take up- i.e. 2.4 " = 26.4"
Therefore, the number of warp ends needed is 16(for each inch width) x 31 = 496 warp ends. HOW MUCH WARP YARN DO YOU NEED? Each warp end needs to be 6 yards. BUT to create a selvedge you need 8 extra threads- 1/2" - on each side of your warp i.e 16 x 6 yards of yarn = 96 yards. Total warp needed 2,976 + 96 = 3,072 yards. 2,835.6 meters. Uppingham Yarns say there are 2,875m in 500g of their Shetland style yarn!!!!!!!!!!!!! Given there are 2 colours in the warp then a 500g cone of the main colour is sufficient for this projects warp. We have already calculated that we need to weave 31" width having taken shrinkage and take up into account and a length of 184". 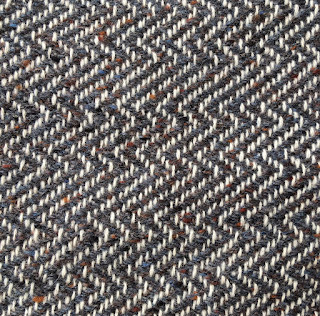 For a 'balanced' twill weave there will be 16 weft threads across each inch of fabric. 16 threads of 31 inches in each of 184 inches of fabric = 91,264 inches of weft yarn =2,340 meters. So a cone of 500g/2,875m is sufficient for this project. 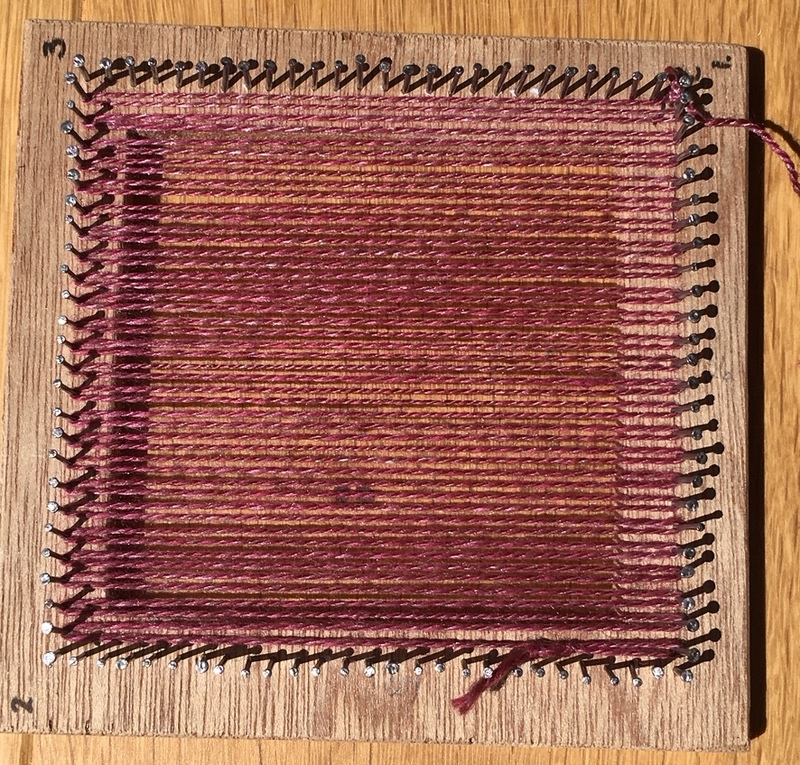 Again, 2 colours are being used in the weft so a cone of each is sufficient. I have a lot of yarns left from the time before I started working solely with hand dyed silk. I am doing a lot of spinning at the moment. Spinning yarns to weave with was my reason for learning to spin. The spur for me to improve my spinning was getting yarn of a consistent thickness strong enough for a warp. I have previously achieved this with silk but one can't wear silk all the time! 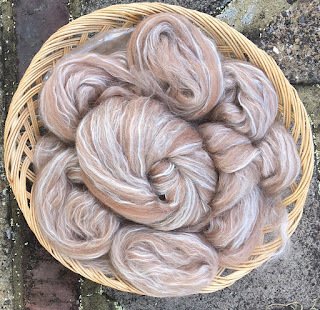 Having discovered two things, the first being that organic woollen fibres, mainly merino, don't irritate my skin, the second a great supplier, John Arbon, of attractive fibre and colour blends I am now spinning organic woollen fibres so I can produce lengths of fabric for some clothing. Spinning this yarn is taking some time and I am drawn to my weaving shed and woollen yarn that I bought some 30 years ago. Three of those in the photo are some of the 'stash'. 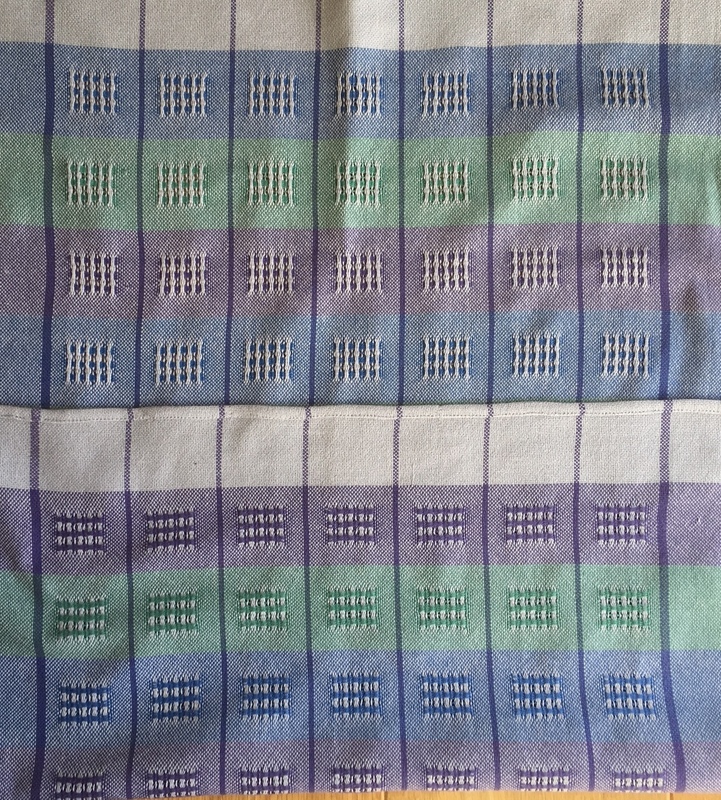 The fourth, the peacock blue on the right, is some bought more recently from Uppingham Yarns and left over from weaving a twill length last year. Well, I'm nearly at the end of a 5 yard warp and I'm quite pleased with the effect. If I finish weaving it tomorrow i will get it in the washing machine to full and hang it to dry on a roller. I have spent some time spinning a big batch of fibre tops, from John Arbon again, to fulfil my ambition to weave a length of fabric from my own handspun yarn - the reason I began spinning in the first place! The wound balls below are 'Toot Sweet', organic merino and silk, intended for the warp. Each of the 21 balls is approximately 50g, 20 wraps per inch, that took me about two evenings each to spin. I have carefully measured each one and find that I have more than 4,200 metres, more than enough for a 7 metre warp, 34 inch loom width. 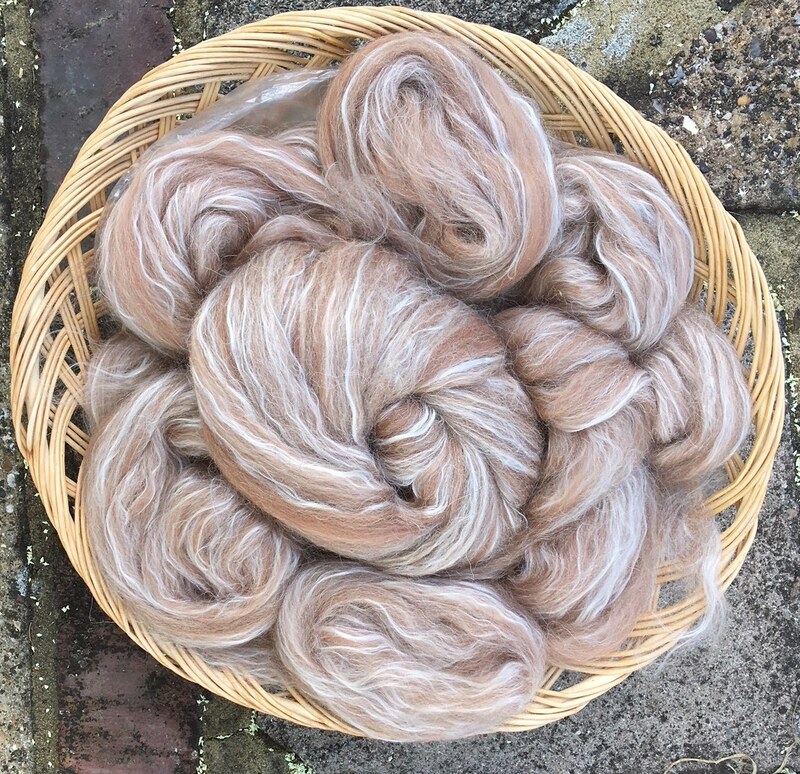 This basket contains the first of the fibre for the weft yarn, 'Rose Gold' alpaca supreme, again from John Arbon. It will take some time to spin this 1k batch and I am purposely not beginning it until we get back from holiday. I find it can be difficult to keep to the same weight and twists per inch after a long break. If I manage to spin to the same weight as the red I have calculated that my twill warp will need 14 ends to the inch. I thought I might be able to do a small sample, to wash/wet finish, on this pin loom to check the right warp sett. Unfortunately, as you can see, a tabby weave would be more appropriate as it is only 12 threads per inch. Hey ho! it may suite a different project! I have a number of woollen yarn cones on my shelves so I decided to try the weave draft I have selected, possibly, for the handspun yarn. I believe it's called 'Wall of Troy'. 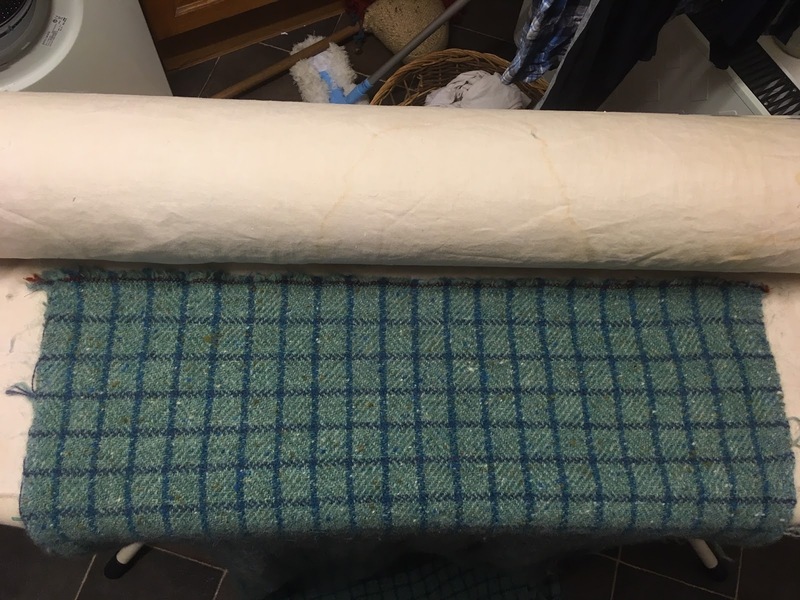 After weaving over a metre of this I reverted to a simple 2/2 twill treadling in order to get the length off my loom but I've not finished the length yet. Last year at Fibre East I decided to replace the drop spindle that I mislaid some 18 months ago. The one I settled on is lighter than the one I had before. Wow are they great spindles! both beautiful and practical. 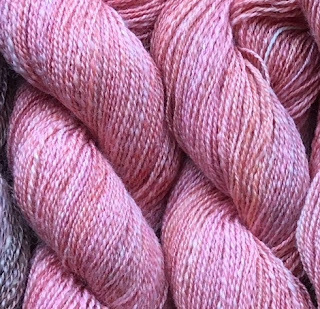 I bought 200g of fibre from John Arbon - Tutti Frutti - a blend of organic merino and silk, chosen because, finding other merino fibre uncomfortable to wear, I would be able to make use of any yarn produced. I am very please with the end product, even though I didn't produce a yarn of consistent thickness, the singles being finer than I'd ever spun before on a drop spindle. That, in part, is due to the weight of the spindle which is 23 g.
To spin the singles I use a variation of the method I see most others use. I want to keep the spindle turning for as long as possible to produce the longest length of singles that I can - economy of effort - so I roll the shaft of the spindle up my thigh. This way the spindle spins longer and I can spin over one metre without stopping to wind the yarn on my spindle shaft, but I have to draft quickly to ensure there is not too much twist in the yarn. What does one make with 200g of yarn? A rummage in my workshop may well have supplied the answer, fingers crossed. Perhaps a weft for a scarf with Tuti Fruti and some hand dyed silk for the weft. I have labelled each skein and I'm in the process of counting the number of yards I have produced on my umbrella swift. A task I don't relish, but better than finding myself short of yarn. What do you do when the temperature is too low to work in your garden workshop? Well, luckily I have an understanding hubby and room to spare in the dining room. It was actually his suggestion to bring my folding Harris floor loom into the house! I couldn't get on with the piece on my floor loom because of the low temperature when it snowed last week but this was a great solution. I have recently been trying to destash the woollen yarns I have had on the shelves for nearly 30 years and so rummaging around on the corner shelf I found 2 cones with the blue flecked tweedy yarn. Not enough, I thought, for a whole length of fabric but when it ran out and with warp left to weave I had other yarns that would be suitable. The decision was made - cushion covers. 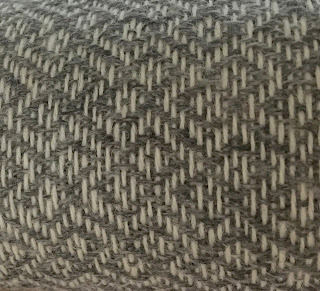 I had seen a number of twill weave cushions on the shelves in 'home' stores, so they must be the 'in' thing and I had the perfect warp yarn already on the loom! The finished length of fabric 4 yards, 24 inches wide, weighing 900g. there was 12" of waste warp at beginning and end which weighed 32g. At the moment I am unable to find my record of the tweed yarn weight! As this is not to be repeated I guess it doesn't matter too much? A case of 'do as I say not as I do'. I will post the info when I find it - says I feeling guilty! The 2/2 twill repeat, 12 picks to the right, 4 picks left, 8 picks right, 4 picks left. Thankfully not as mesmerising as I thought it might be! This is a Flickr badge showing items in a set called Scarves and Shawls. Make your own badge here. Married for 49 years now, with two sons. I retired from my 'real' job some years ago and took up my favourite craft to fill time and earn a crust or two selling my woven wares at craft fairs. It was soon apparent that some low priced items were needed to help pay expenses and so my other craft interests, paper crafts and braid making to name just two, found their place. Paper crafting and card making have become my main relaxation activities. Gardening and walking will come more to the fore in warmer months.